Why is cruise control so complicated? 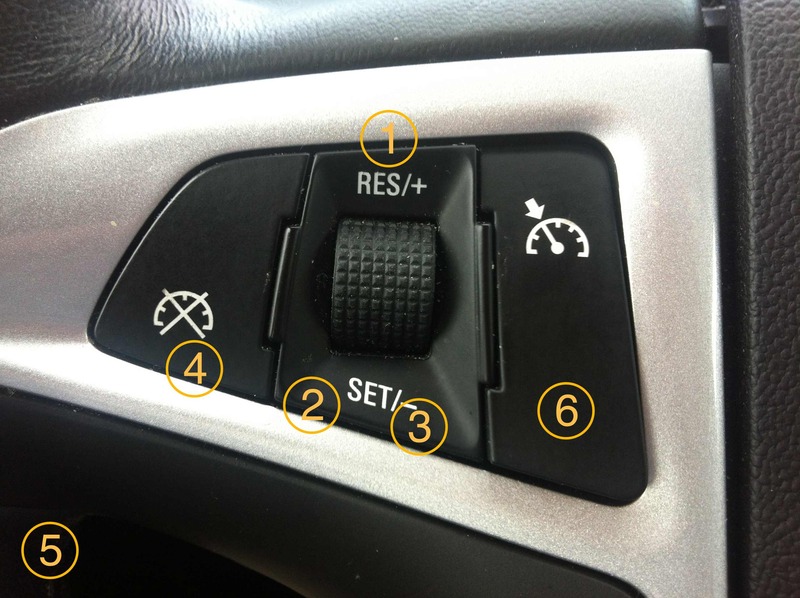 From left-to-right, my Chevy Equinox has a cancel button (4), a two-way slider (1,2,3), and an on/off toggle (6). Setting a cruise speed takes two actions: toggle cruise control on then push the slider down to SET the speed. But once I’m going, there are six — six! — ways to change my speed. The system starts in Cruise Off. Flipping the toggle ON enters the Not Set substate of Cruise On. Pushing the slider towards SET starts Cruising at the current speed. From Cruising there are the six means of changing speed, each of which has a subtly different result. Sliding + keeps the car in Cruising but changes the set speed by +1 mph. Sliding – keeps the car in Cruising but changes the set speed by –1 mph. a. Releasing the accelerator, which allows the car to slow back down to the set speed. b. Sliding SET with the accelerator still depressed, which returns to Cruising at a higher set speed. Pressing the brake to exit Cruising and enter Set but Not Cruising, where the gas and brake work as normal. a. Sliding SET to return to Cruising at a new set speed. b. Sliding RES to return to Cruising at the previous set speed. c. Pressing CANCEL to return to Not Set. Lastly, toggling OFF from anywhere returns to Cruise Off. So the cruise control can be either on or off, where the distinction is OFF means none of the other buttons do anything and ON means they do. When cruise is ON a speed can either be set and active, set but suspended, or not set. To use this monstrosity, the driver has to internalize this state machine and consciously keep track of where they’re at.2 This is an awful lot of complexity for what should be an exceedingly simple activity and reminds me of Joel Spolsky’s article on confronting users with 15 different ways to shut down their laptop. A cruise control really only needs a single button and two states: Cruise Off and Cruising. Pressing it turns cruise on and sets the cruise speed. Pressing it again turns cruise off, as does—for safety reasons—pressing the accelerator or brake. That’s it, set or not, and one button replacing four. Sounds like progress to me.